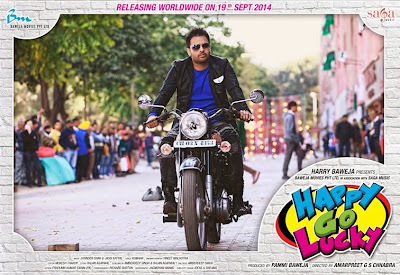 Amrinder Gill is back with "Vichhoda", New Punjabi Song 2014 from the upcoming Punjabi Blockbuster "Happy Go Lucky", music directed by Jatinder Shah and written by Kumaar "Vichodeyan ne saanu adha adha karta, sukhe sukhe naina ch hanjuan nu bhar ta"
Happy Go Lucky is an upcoming Punjabi movie 2014 under the banner Baweja Movies Pvt. Ltd in Association with Saga Music starring Amrinder Gill, Harish Verma, Sumit Sandhu, Gurpreet Ghuggi, Isha Rikhi, Shruti Sodhi, Dakshita Kumaria and Shivani Saini. The movie is scheduled to release worldwide on November 21st, 2014.